My girl can't get enough of reading. So much that she wouldn't put this book down one day. I made her stop trying to read while walking because if she takes after me it could be disastrous. So I never got you a Taylor Tuesday or Elizabethursday, so here is your Sister Saturday. Love these too goofballs! I asked them to smile and got this. Funny how they do this without even talking to each other. After a few requests they allowed me to have this one too. As much as I like seeing their sweet smiles, I love their goofiness more. I feel bad for my friend that is going to be taking our family pictures soon. Who knows what they are going to come up with for her. 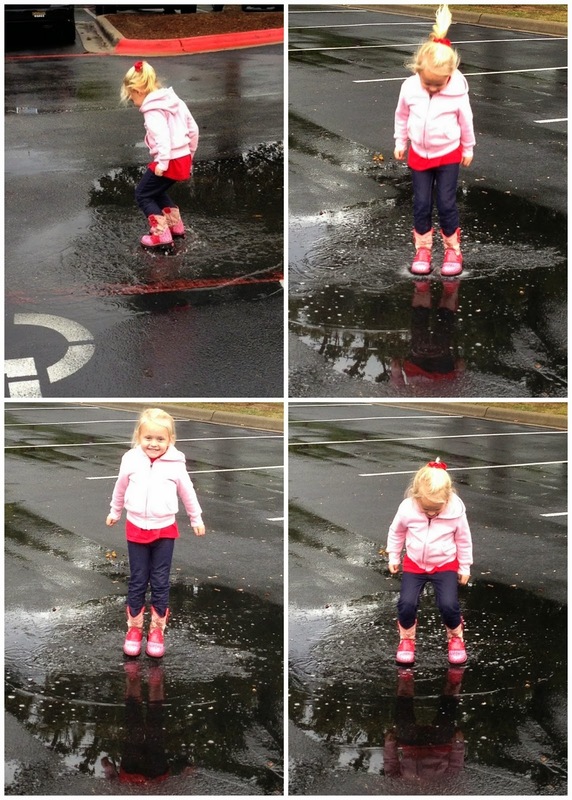 Puddle jumpin', ponytails, and cowgirl boots make this girl happy. What's a Mom to do besides let her do some jumping? My rainy morning was made brighter by this girl. Hope she brings you some of her sunshine too. It's hard to believe that it's already been 4 years since Lizzie was born. I asked her on Saturday how she got to be four and she told me 'Because it's my birthday today.' Well yes child I do realize that, but how have four years already gone by??? Some days it might feel like it takes forever to make it through a day with her, but other days I just want to slow down and hold her just a little longer each time she lets me. Lizzie has been debating party themes since we celebrated Taylor's birthday in April. My rule is that I need to get past one birthday before the next kid can even think about a party idea. Not to mention that I have six months to get ready for the next one. I finally took Lizzie to Party City and let her see all the options and pick one. Keep in mind that between the two girls we have had a Frozen, Strawberry Shortcake, Fairy, Hello Kitty, Minion, Bubble Guppies/Nemo, Princess, Ladybug, and Sesame Street themed parties. 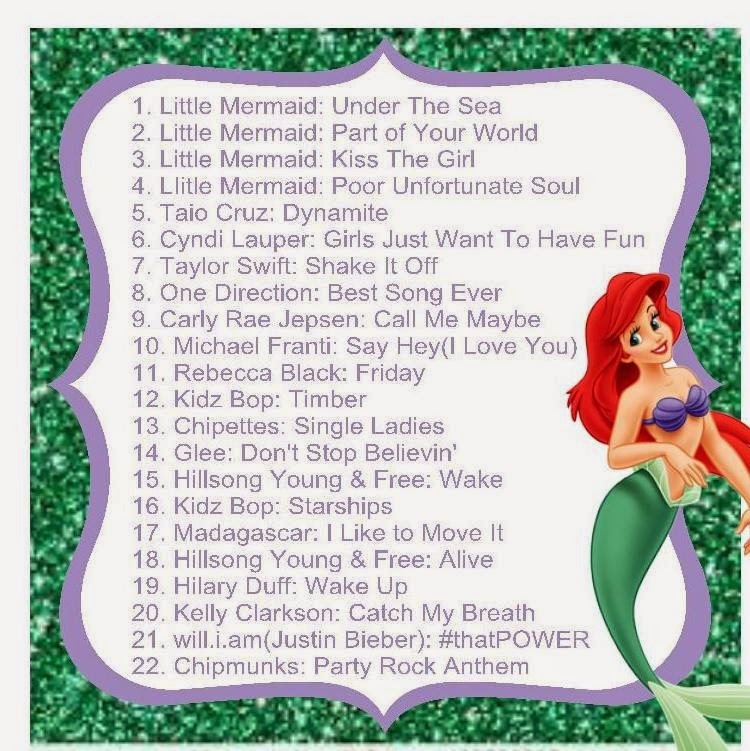 Lizzie decided to keep it fresh and chose Little Mermaid. 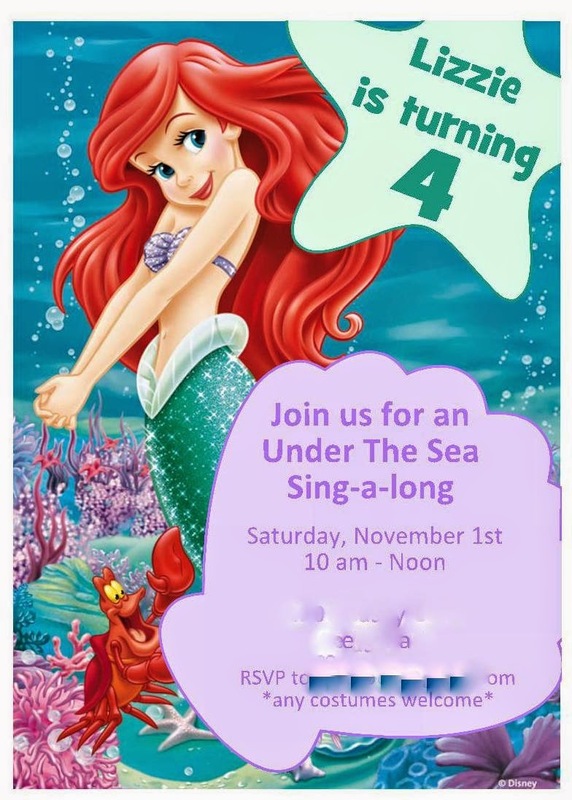 She also wanted to do a sing-along style party similar to Taylor's so we decided to an Under the Sea Sing-Along. 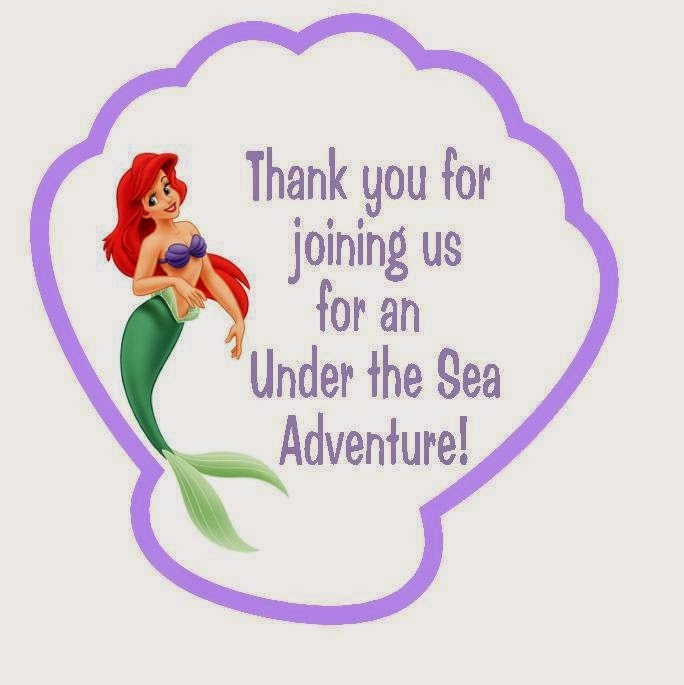 I have loved Little Mermaid since it came out the first time(I'm not going to mention how young I was) and Pinterest offered a full selection of ideas to plan with. Lizzie really wanted to help with her party so I let her pick a lot of the design and decorations. I surprised her with a few but what fun would it be if there weren't a few surprises. Lizzie loved Ariel's sparkly tail in this picture so I found a way to use it for her invitation. Poor Flounder had to get covered up by a star so that I could get all the information on the invitation without covering up too much of that sparkly tail. 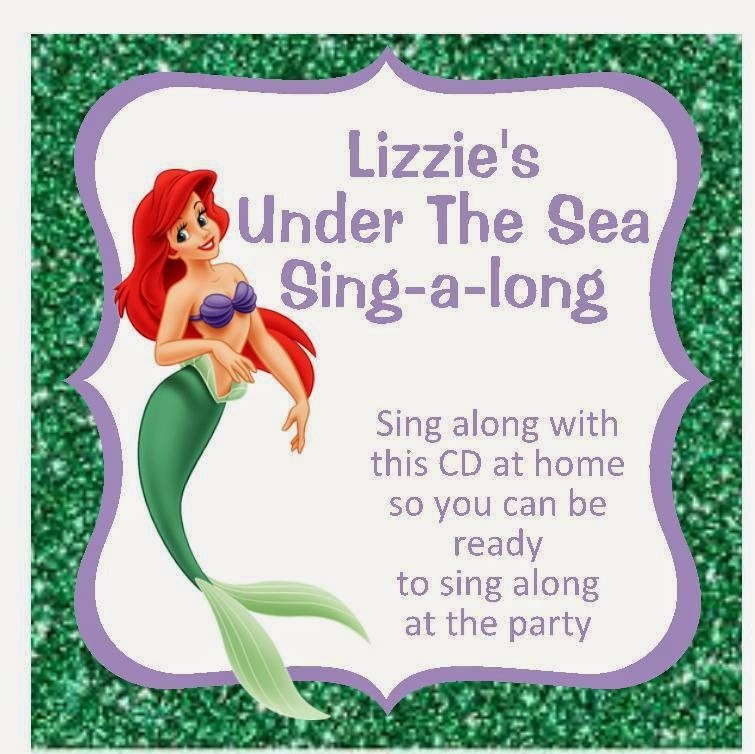 Along with the paper invitation we included a CD with some of Lizzie's favorite songs. I did this for Taylor's Frozen party so I thought I had it figured out. Lesson learned when printed the CD inserts before trying to burn the CD. I was 17 seconds over what would truly fit on the CD so I had to carefully white out number 20. We love us some Kelly Clarkson, but she just didn't make the CD cut. We did play her video during the party. I am still trying to explain to Lizzie why Macklemore and Jason Derulo weren't the best songs to put on a CD for her friends. Keeping with the Under the Sea theme, I made shell shaped tags for the goodie bags. Lizzie found small plastic slinkies with Ariel on them at the party store and declared them a must-have for her friends. We also included a sparkly bracelet and some Ariel stickers. The girls are fascinated by my Silhouette and the things I can make with it. I saw this scrap piece of wood in the garage and just had to make a sign for the front door. I figured we can also use it in the backyard later or give it to my in-laws for near their pool. Since I already had the wood and vinyl, it was pretty inexpensive to get a can of purple spray paint. I'm surprised we didn't have some already but I'm sure I'll find a use for it again in the future. Taylor had the idea to add bubbles around the mermaid to really make it look like she was swimming and then to have the bubble machine on the porch. Pictures wouldn't capture the bubbles but the girls loved it. Chris' mom made the adorable shirts for the girls. She was so sweet to take Lizzie to the fabric store and let her pick the fabric for her mermaid shirt. At a friend's birthday party this summer I saw how cute it was when you sewed two strands of crepe paper together and let it ruffle. I just knew it would be the perfect kelp look for the living room and a fairly inexpensive decoration. It took about an hour to sew up two of those huge rolls of green crepe paper together but the end look was awesome. Then I just used push pins to attach them to the ceiling. We had the party in the morning so I just needed snacks for the kids. We had Under-the-Sea Sushi, Oyster Cookies, Grape Seaweed, Octo-ranch dip and veggies, Goldfish Bait, and Dinglehopper Cupcakes. The sushi is rice krispy treats with a swedish fish and wrapped in a strip of fruit roll-up. Sounds odd, but the combination is pretty yummy. For the Oyster Cookies, I used simple sugar cookies(store bought so they would be a bit firmer) with cream cheese frosting in the middle with a candy pearl(from Hobby Lobby). I learned that it helps to have thicker frosting for this(I refrigerated mine for about an hour first) and to put more towards the opening to give it that clam look. The ranch dip was supposed to have an adorable octopus made from an upside down red bell pepper, but I simply ran out of time. No one seemed to notice. Not everyone understood the Dinglehopper Cupcakes, but if you've seen the movie a few times you know the joke. If kids didn't want to sing and dance to the videos, then they could play outside and/or decorate a crown. We had foam crowns, peel and stick jewels, and glitter glue pens. Lizzie had told me to make sure there were blue crowns for the boys and I was excited to see that they had as much fun making a crown as the girls. Lizzie even ditched her fancy Ariel crown at one point to wear the self created one. Taylor was awesome about helping all the younger kids make a crown. We wrapped the party with the pinata that Lizzie insisted on. I tried to get out of having one since her party was the day after Halloween but when we were at a friend's party and she informed the mom that she was also having a pinata I knew I was in trouble. Lesson also learned that pinata's with the pull strings are very hard to break with a stick. Every kid got to take several whacks at it and it still didn't crack. Then we let them start pulling the strings. I guess there was a candy-clog because barely anything came out. We let another dad take a whack and it split right open. I think he had more fun than the kids! Our family likes to do a birthday dinner/lunch since the kid's parties can be a bit busy. Lizzie chose Hibachi since that is her current favorite restaurant. She would go there every week if she could. When I asked her what she likes about it she said the noodles, the soup, and the FIRE! Lizzie insisted on wearing her crown to the restaurant and was a little bummed when I wouldn't let her wear it to church too. She was not shy about asking me to make sure they knew it was her birthday. We've been so much lately that she was predicting what would come next in the food show but she didn't predict that the chef would sing Happy Birthday during his show or that they would bring her out a HUGE ice cream sundae. 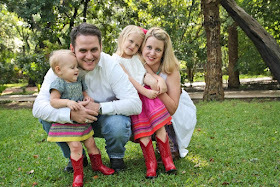 It was a wonderful weekend celebrating our baby girl and her fourth birthday. I'm sure Lizzie will try to find some way to keep it going for a few more days and I just might let her. I also know that there is still kelp hanging in my living room and I would rather just spend the time hanging out with my girls than finding the stool to take it down. Maybe I can find a way to turn it into a Christmas decoration. Our little fall cutie for you. Lizzie insisted she needed a picture by the flowers we planted. Ah! I just realized that my last picture for you guys was in September. Surely you must think this is more of random thing than every Tuesday now. And here it is Wednesday and I'm getting this out. Well... Happy Taylor Tuesday/Wednesday then. With Taylor in school, it is rare to have her all to myself. Last week her school got out early and we had a little time together before having to pick Lizzie up from school. Her class met up at the park for a little bit to play. Both girls love this spider web at the park and immediately crawl to the top. It was a gorgeous day and I couldn't resist a picture of our girl. On Mondays Lizzie and I go grocery shopping. She loves to go with me. Not sure if it's the slice of turkey that the deli ladies always give her or the dum-dum that I often have in my purse for her, maybe both. On this particular grocery trip she declared a little bit of everything from her wardrobe. A dress, cowgirl boots, jacket tied around her waist(in case she gets cold), bandanna for a face mask, and her purse full of random stuff. I'm pretty sure there are a few coupons in that purse in case you need one for cat food or fruit snacks. A girl's gotta have her priorities on what coupons to clip. Taylor had been waiting for months to loose her first tooth. Almost a year ago the dentist said that two of her bottom teeth might be loose soon but nothing for months. Taylor even wrote two letters to the tooth fairy wanting to know when her time would come. Then she came home from school Friday mentioning that her bottom teeth were sore. Wiggling teeth grosses me out. I know I have many years ahead of me of children loosing teeth, but I just can't stand to watch it happen. Taylor's tooth was so loose this morning that she barely ate breakfast for fear of losing it. Luckily it fell out before lunch at school so I didn't have a starving kid on my hands. Props to the school nurse for having fun little treasure boxes for when you loose a tooth. Taylor went to bed tonight with a letter proudly displayed for the tooth fairy and her tooth tucked into her tooth fairy pillow. (I bet the tooth fairy loves that she doesn't have to find that itty bitty tooth under her pillow tonight) While she dreamed of fairies Chris and I were busy googling the going rate for a tooth. I heard that our fairy left $2(big money for the first tooth) and a Rainbow Magic Fairy book about the Tooth Fairy. Here's our girl with her new smile(and sassy new haircut). I usually have sweet photos of my Taylor, but this one made me laugh. Taylor asked to get her hair cut and I think she got a case of the sillies with this sassy new hairdo. She walked around all day flipping her hair and asking if I thought it was cute. Of course it's cute, it's on her and it was not done by me. We all know how I can butcher her hair. I struggle to decide between the plethora of pictures of Lizzie for you each week. That crazy kid always has something funny happening. It helps that I have several hours a day before and after preschool and a few days during the week when it's just the two of us. I needed a few things from the mall one day and bribed her with Chick-fil-a. Little did a know that I would get a show with lunch. After watching her go through a few faces I grabbed my phone and started taking pics. 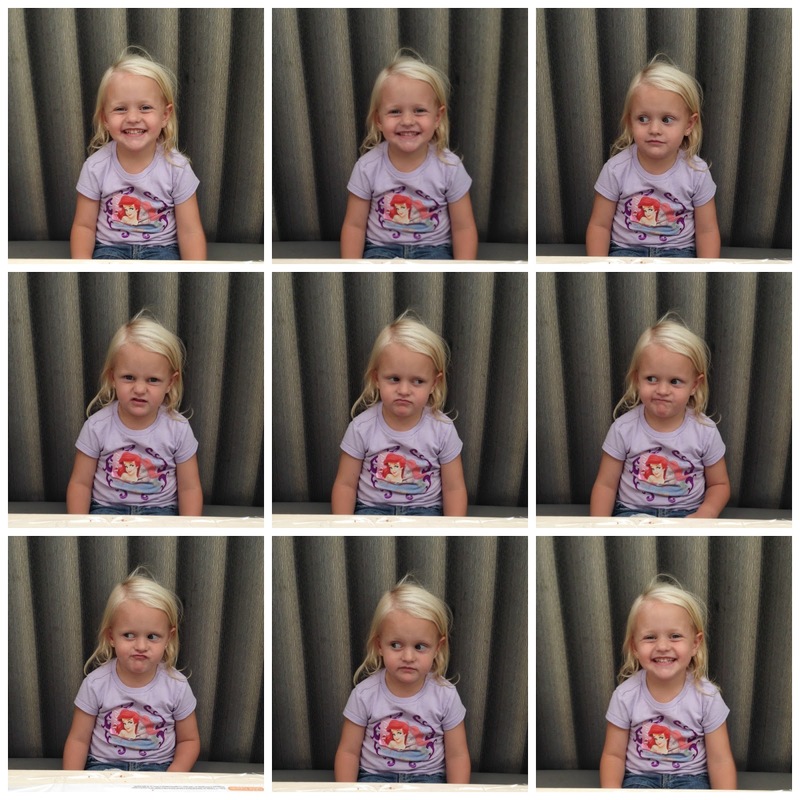 These all occurred in about 30 seconds. This girl fills my heart thiiiiiisssss much! I took Lizzie to the park last week to feed the ducks and geese. They practically chased us to get the bread and Lizzie kept telling them to be patient and they would all get some. Then she turned to me and said "Mommy, if I feed them they will come close enough for me to hunt." I think she's ready to go hunting with her Daddy! Let's pretend it's Tuesday for a few minutes so I can be on time for this. My laptop and I are not getting along very well right now, so I am going to try to get this done before it decides not to play nice anymore. Taylor started 1st grade last week. How did that happen? How did my baby girl start changing into this beautiful young lady? I can see such a difference between last year and this year. She has a bit more confidence walking the hallways at school and such a different view on learning now that she can read. Last night she told us that her favorite way to study science is to read about it. She loves her teacher and enjoys going to school. I can't wait to see how this year goes and how our girl does. I promise to try and keep up with my Taylor Tuesdays so you can follow along too. 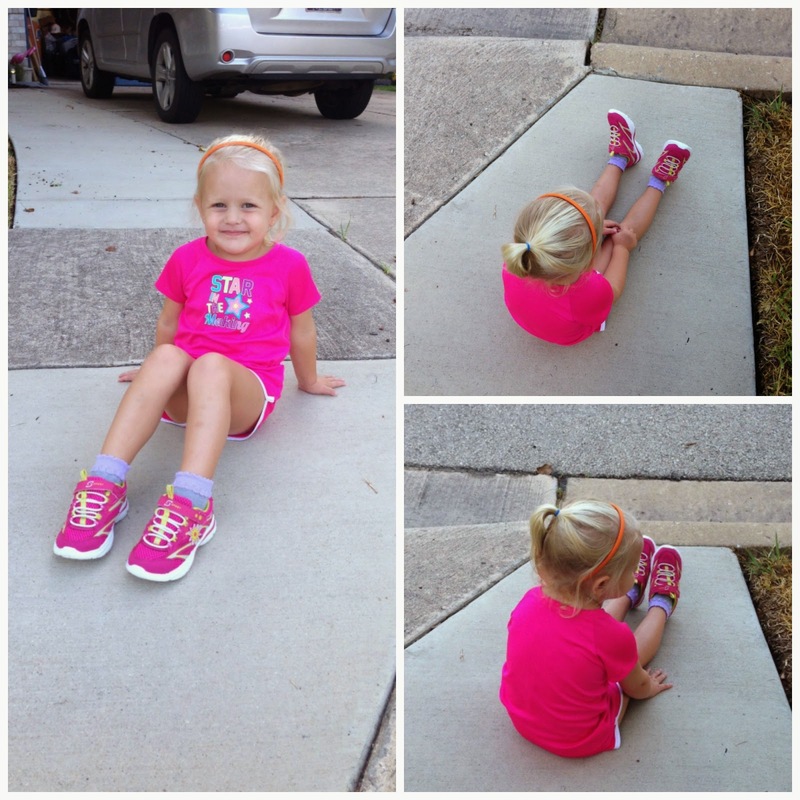 Lizzie got new tennis shoes for preschool and couldn't wait to wear them. I tried my best to make her wait until school started but she just had to wear them for her day with YaYa. She also wanted her "sporty" outfit to go with her new shoes. She decided to sit at the curb and wait for YaYa to come pick her up so that she could see her shoes when she pulled up. We recently got a new kitten and the girls are having a blast with him. It's fun to see how the girls interact with him. Ollie has learned that Taylor means cuddles and snuggles. 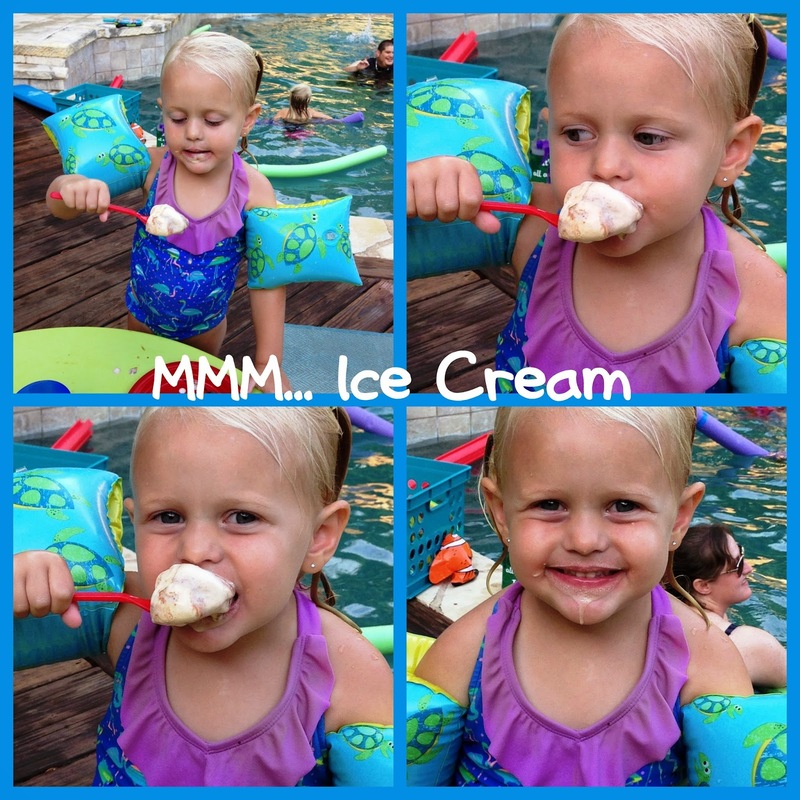 Why bother with small bites when you can eat it all at once and then rinse off in the pool? I have the best of intentions to keep up with this but keep failing. But that doesn't mean I won't keep trying. I took this picture of Taylor on the 4th and just knew it would be perfect to share. I know you can only see her outline, but she moved to sit up on a concrete block so she could be that much closer to see the fireworks. I loved looking up and seeing her in shadows surrounded by the sunset. She just wanted the best view possible, but I think I had the best view being able to watch both the girls enjoy the wonder in their faces during the fireworks. Darn tears betrayed me again, but thankfully my sunglasses kept Taylor from seeing them. I made it through graduation without them falling, but dropping her off for the last day of school tugged at my heart. How is she already done with kindergarten? 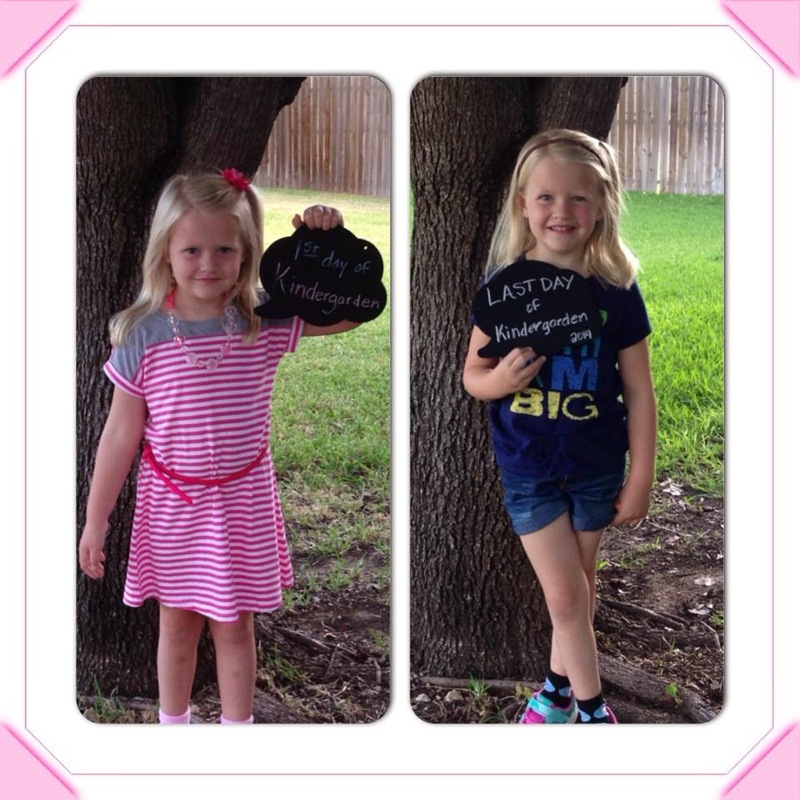 My baby girl will be considered a 1st grader in just a few hours. We are so excited about summer around here, but I need time to slow down and let me enjoy my girl while she’s still little. I say little, but at 6 she is growing like a weed. This year has been a huge learning experience for our house. I didn’t realize how hard it would be to sometimes to get everyone up, dressed, fed, lunch made, and out the door by 7:30, but we were never late no matter how many times I yelled at Lizzie that we were going to be late. I know that working moms do this all and do it much earlier in the day. But in our house we’ve been able to sleep in a little later and preschool didn’t start until 9:30 so mornings could be a bit lazy. I am thankful for summer and the ability to stay in our pjs past 6:45. Well there was that one morning that I overslept and had to do the car drop off in my pjs but they were cute and I prayed that I wouldn’t have to get out of the car for any reason. We also adjusted to reading and math homework each week. There were a few Thursday nights that we were rushing to get it done, but it got done. Taylor grew from this shy girl to a bubbly girl that made friends with all the kids in her class, was brave enough to volunteer to be the first presenter for her research project, finished a year of Daisy Girl Scouts, scored her first soccer goal in co-ed winter soccer, finished a year of gymnastics and almost mastered her cartwheel, fell in love with edamame, and most importantly… learned to read. We have watched Taylor go from sounding out words in the books sent home from school to realizing she can now read signs, things on tv, books at home, instructions for games, and I find her trying to read my texts. I love that she made that jump this year and we have enjoyed seeing that excitement as she reads new things. Congratulations my sunshine on finishing your first year of school! We can’t wait to see what each new year brings and I know there will be more tears each year that I realize you are growing but it’s only because my heart is full of love for you!